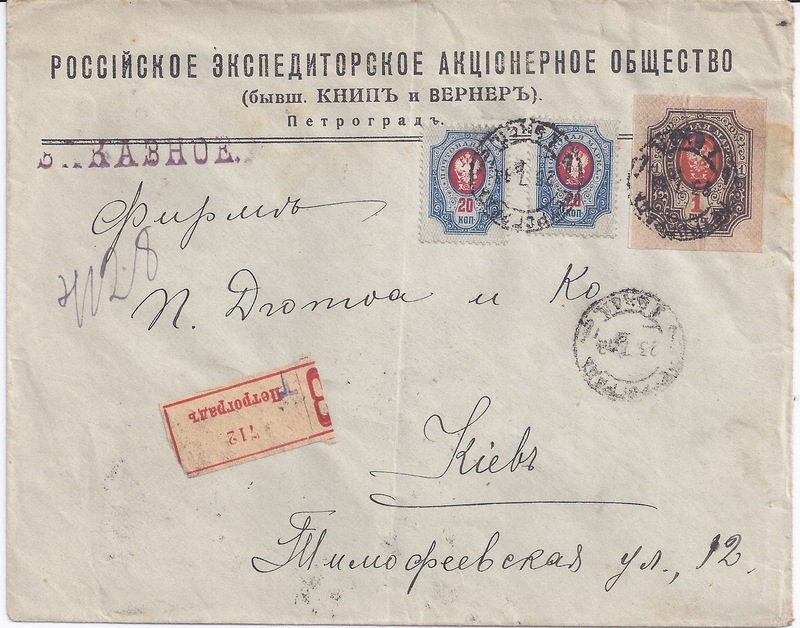 Relations between Bolshevik Russia and independent Ukraine were constantly changing during 1918 and this is reflected in the postal history. A period of stability was created by the March 1918 Treaty of Brest-Litovsk and associated agreements which provided for a German and Austrian Protectorate-like Occupation of independent Ukraine, administered by the subordinate regime of the Hetman Skoropadsky which was headquartered in Kiev/Kyiv. Russia accepted the occupation of Ukraine - for example, surrendering Bolshevik Kharkov / Kharkiv to German troops in April 1918. 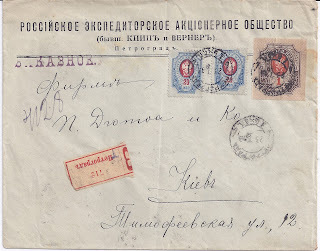 Postal relations were resumed after Brest-Litovsk but my notes say not until July (I don't know where I got this information but probably from Alexander Epstein). As soon as Germany and Austria collapsed in November 1918, Russia moved to take the place of those powers in Ukraine. For the period July - November it should be possible to find mail in both directions. Either I have not been looking carefully enough or such mail is very scarce. I can show only the one clear example illustrated above. This is a double weight Registered letter, charged at the RSFSR inland rate of 35 kopecks for the letter + 70 Kopecks Registration + 35 kopecks for a second weight step = 1 rouble 40 kopecks. It was sent from PETROGRAD 1 EXSP 28 7 18 using an inland Registration label. It has KIEV 8 8 18 receiver cancellation on the reverse - and I assume both sides were using the New Style calendar. The cover was posted a couple of weeks after the assassination of Count Mirbach, the German Ambassador in Petrograd so at a time when Bolshevik - German relations were under renewed strain. In the reverse direction, it should be possible to find mail franked with Imperial adhesives but also Ukraine General Issue and Trident stamps.